Gain Sense: My Review Of Ambronite, The "Drinkable Supermeal"
Using Ambronite is a breeze. All you do is tear open the packet, add it to a shaker bottle containing around 18 ounces of water, and shake away until it's mixed to your liking. Once that's done, you can let it sit for two minutes, which gives it a smoother finish. Compared to other super drinks, Ambronite is pretty grindy, but there's a good reason for that. It's because it's not a synthetic powder; it's an assortment of various finely ground nuts, greens, and berries. The drink's relative chunkiness didn't bother me at all, in fact I found it to be one of Ambronite's strengths. It really feels like you're drinking a full-bodied meal, not some liquid-based dietary supplement. How does Ambronite taste? Not bad. Not bad at all. It's vaguely nutty tasting, with a hint of sweetness provided by the berries included in the mix. I don't know if I would call it delicious, per se, but I had no trouble downing it in under five minutes. It sort of has a neutral flavor, like bread, or in this case, toasted bread with an extremely thin layer of berry jam spread atop it. But who knows...maybe the flavor grows on you over time, like coffee or beer. The website states that Ambronite gives you around "4-5" hours of fullness, which I think might be the case for most people. Drinking it for breakfast, I found that it kept me satiated for around 2.5-3.5 hours. The disclaimer here is that I'm the exception, not the rule. I run a lot, have a fast metabolism, and am a fairly tall/broad person, so 500 calories (the amount in each packet) won't go as far for me as it might for others. I definitely think that Ambronite, and other products like it, have a place in today's world. At least from a personal perspective, having something like Ambronite back when I was in college would have been nice, as I often found myself starving with only 15 minutes to spare between classes. Instead of wasting $5 on a muffin at my school's cafe, I could have whipped out a bottle of Ambronite and been satisfied for far longer (not to mention it's far more nutritious than those aforementioned muffins). Currently, a monthly subscription of ten packets of Ambronite will set you back $84.15. Or, you could opt for buying a one-time purchase of five meal packets for $59. That might sound like a lot, but the price should come down once Ambronite becomes more established. The reason for the cost is the high quality of the ingredients, as well as the fact that the company truly believes each packet serves as a full meal replacement. Ergo, if you're going out to eat everyday at work and spend $11 doing that, you'd likely save money in the long run opting for Ambronite instead. I think Ambronite's niche (at least for me) would be for "spot meals," that is, you save it for those moments when you're short on time and don't want to skip a meal (this might happen a lot in certain professions). In that case, ten packets could last you a decent amount of time, especially if you usually keep an orderly schedule. I also think that Ambronite would work well for runners, or others who do high intensity exercises on a daily basis. Instead of burning your money buying buckets of synthetic protein mix, you can put that cash towards a more natural, nutritious, and filling option like Ambronite. After testing out Ambronite, I'm left mainly with a feeling of excitement, both for the potential of the product and for what it means in regard to the future of food consumption. 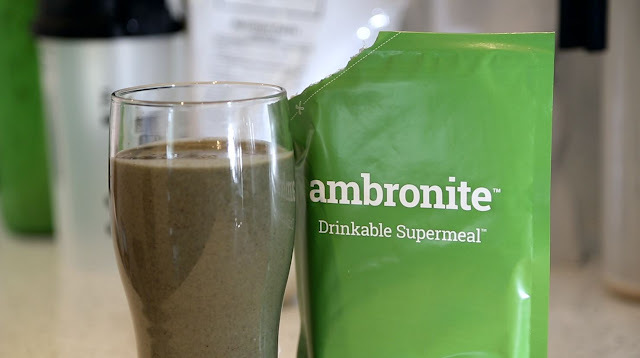 So yes, Ambronite truly is a "drinkable supermeal," and I'd recommend it to any of you who lead hectic lives and want a quick meal option that's actually good for you. With luck, Ambronite will make a dent in today's fast food industry, which by and large is saturated with extremely unhealthy options. If you're interested in purchasing Ambronite, feel free to use the code GAINSENSE10 for a 10% discount. Enjoy!